Trade promotions, a marketing staple of consumer packaged goods (CPG) companies, are a big, messy management challenge. Poor coordination across functions can cripple logistics efficiency, which requires timely receipt of information to minimize warehousing, labor and freight costs. 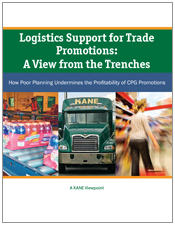 This white paper outlines how to save hundreds of thousands annually on logistics support costs for high-volume promotions.